To make the set feel as real as possible, set decorator Ellen Brill stayed true to New Orleans style decor, choosing pieces with a French influence and feminine shape, but still had spooky potential, "Everything has a spindly, kind of scary framework to it. Anytime it could look spidery we wanted it, because with lighting we knew we could get great reflections on the walls from pieces like that." By using light walls, flooring, and trim, this enabled production to get the contrast they needed to play against the dark woods in the staircase and antique furniture pieces throughout the rooms. Our favorite look. With the grand architecture and extremely high ceilings, Brill wanted to keep the rest of the look minimal, finding a balance between lived-in and uninhabited. Director Ryan Murphy wanted a "glacial, icy, cool palette," Brill says of the white-heavy set. "Every time I went shopping I was looking for something that was a cool white or if the furniture was too wood-tone we would paint it. Then it was figuring out where to leave the wood dark so it would pop against the white." With the nearly colorless palette, Brill wanted to create a notable backdrop that wouldn't steal attention from the actors, but also to encourage a mysterious, almost ominous vibe. New Orleans is famous for its voodoo and history of magical things, so I wanted it to feel like it was real and would fit in." From custom paintings modeled after former witches to furniture with haunting silhouettes, Brill created the ultimate backdrop for a show you're scared to take your eyes off of. Posted on March 27, 2017 by L A M A I S O N G R A Y. 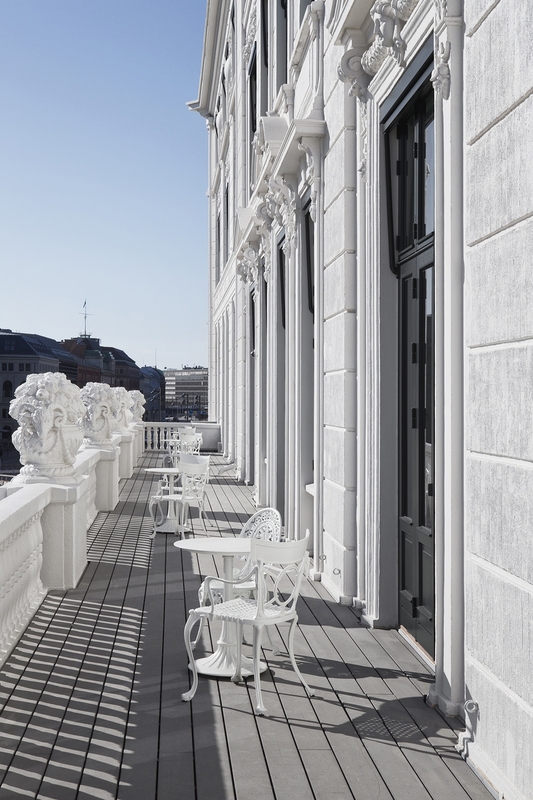 Established in 1755, the d’Angleterre is an icon and a historic landmark in Copenhagen, celebrated for its elegance, luxury and style. Inspired by its rich heritage the hotel has recently undergone a complete refurbishment and has reopened as a revitalized grand palace. Balancing legacy and style with intuitive and tailored services, the d’Angleterre will complement the desires of today’s refined travelers. Balthazar is the Champagne Bar of the legendary Hotel D'Angleterre in the center of Copenhagen, celebrating it's vibrant and metropolitan surroundings. AT D'ANGLETERRE THE NEW, MICHELIN AWARDED RESTAURANT, MARCHAL, IS DESIGNED AS THE INDISPUTABLE DESTINATION FOR WINING AND DINING IN COPENHAGEN. RICH MATERIALS SUCH AS SOFT CARPETS, STONE, WOOD, VARNISH AND VELOUR SET A LUXURIOUS AND STYLISH, YET RELAXED INTERIOR TO TREAT THE EYE IN THE BREAKFAST RESTAURANT, THE WINE ROOM, THE FINE DINING ROOM SERVING LUNCH AND DINNER AND THE HOTEL BAR, WHILE CATERING FOR THE DIFFERENT NEEDS OF THE BUSINESS MAN, THE TRAVELER, THE LOVERS, THE FASHIONISTA AND THE URBANITE. EACH OF THE 90 SPACIOUS AND ELEGANTLY DECORATED ROOMS AND SUITES HAVE MODERN TOUCHES THAT COMPLIMENT THE TRADITIONAL ELEGANT DESIGN TO EXQUISITE EFFECT MANY OF THE SUITES COME COMPLETE WITH GRAND BALCONIES. Posted on September 10, 2014 by L A M A I S O N G R A Y. A D O R A B L E .
They say first impressions are everything. For your home, that couldn't be more true. Using a bold color on your front door will give you that pop of color that will greet visitors with a stylish "Welcome". So go bold! Here are some of our favorites. This gorgeous entry uses an unexpected reverse color combo that screams style! The glassy mirror-like finish from the high gloss enamel is stunning. This has to be somewhere in London! This light blue is so pretty, and it really looks sleek with the contrast of the off-white mill work. The columns and capitols adds to the elegant feel of this entry. This deep purple is gorgeous! Unique and lovely, it speaks so well to the charcoal brick facade of the house. What a looker! And then, there's always the classic "Talbots" red, with shiny brass hardware. So refined. A sunny yellow door is so warm and welcoming, and looks great with so many other colors. And the transom above is very whimsical! Posted on August 15, 2014 by L A M A I S O N G R A Y. 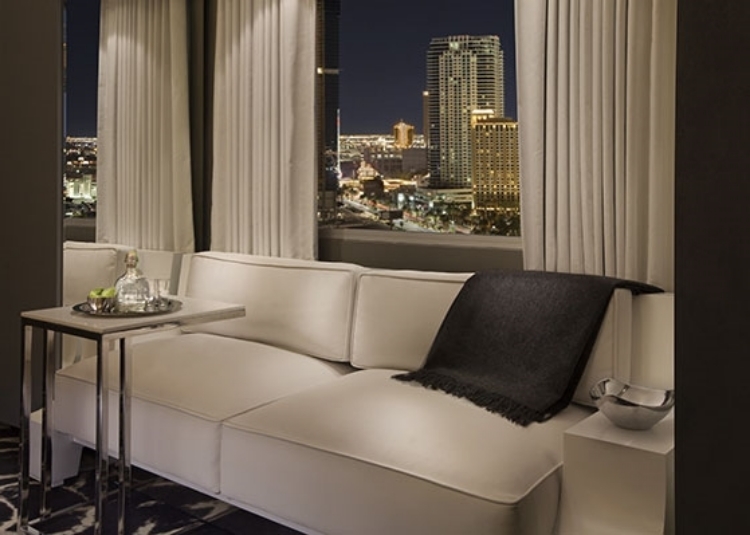 It's the newest (and albeit) the swankiest resort on the Las Vegas strip is setting to impress. With four glistening new towers, and over 1600 suites of swag, it's sure to be the latest hot spot in Paradise (Nevada, that is). The Bazaar by Jose Andres, Katsuya by Starck, Umami Burger, The Sayers Club and 800 Degrees are part of the new SLS lineup. With the greige-toned, neo-classically designed "Lux" suites, it's no surprise that we adore these new ultra-chic and gorgeous guest rooms. And we LOVE the shameless flair of mounted mirrors juxtaposed on the ceiling. Light and rich, fabulous two-tone piped seating, metallic faux bois end tables, the details just won't stop. The use of contemporary palettes will keep these suites looking timeless for years to come. Large bath areas, dual shower heads (standard shower and rain shower), are just waiting for you to indulge. Don't forget to pack our "LUXE" Fragrance Collection to luxuriate yourself while enjoying your glamorous retreat. 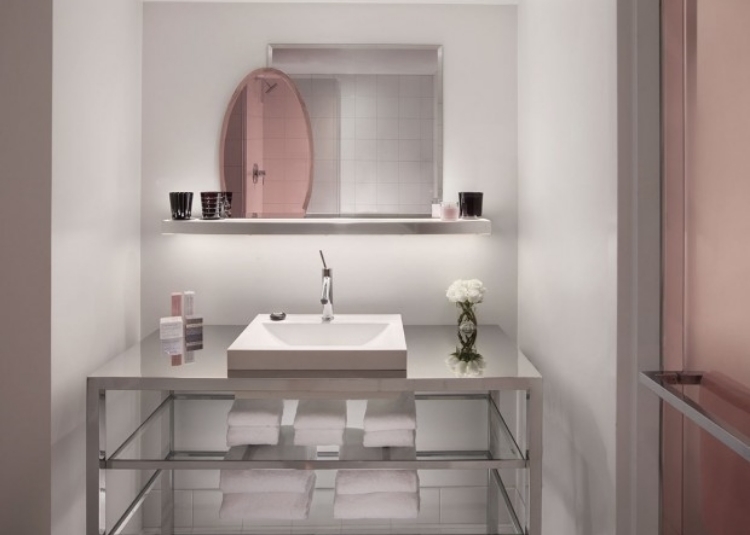 The use of rose-pink accents against ultra-clean lines of shiny chrome and bright white fixtures, really bring a sense of European elegance, along with a touch of whimsy. The artful trompe-l'oeil panels exudes a traditional European elegance, while the neutral color scheme keeps the fresh and modern designs in full view. The palette contrast keeps the designs timeless, while sumptuously deep couches frame the dramatic views. So, treat yourself to the beauty of the newest SLS gem, you won't regret it. Posted on April 14, 2014 by L A M A I S O N G R A Y. Right on cue. Springtime, every year, gives me the itch to begin researching and reading wonderful articles and blogs on Mediterranean travel. Italy is always on the top of the list. I blame Frances Mayes for that. Her simply delectable books on this very subject, allows the reader to be transported. The impossibly fresh tomatoes, aromatic thyme, and basil from the garden. Not to mention the ever-so-fragrant lavender, sun-kissed roses, and the sweet smelling citrus blossoms from the hillside. Posted on March 31, 2014 by L A M A I S O N G R A Y.